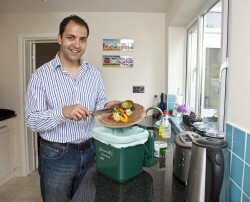 “Whether it's peelings or leftover food on the plate, too many people still throw it straight into the bin. Not many know that this food could actually be converted into energy and natural fertiliser. Black sacks are often torn open by foxes, birds and vermin looking for food, so using the pest-proof food waste bins is also a great way of helping keep our streets clean.